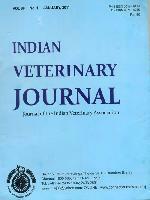 THE INDIAN VETERINARY JOURNAL, a monthly periodical, with an international status is devoted to the cause of Veterinary Science and the advancement of Veterinary Profession. The journal publishes original work in Veterinary Medicine, Surgery, Reproduction, Husbandry, Fishery and other allied subjects useful to the Veterinary, Dairying, Livestock and Poultry professionals. The Journal is of particular interest to the general Veterinary Practitioner of both large and small animals, research workers, field investigators, Livestock, poultry and dairy development officers, marketing officers and to all those engaged in Animal health. Being a pioneer in the field of Veterinary Journalism in the East, its position as an authentic source of information on all Tropical diseases is quite unrivalled. This is an internationally recognized refereed journal. The National Academy of Agricultural Sciences (NAAS), had rated this journal with a mark of 6.0 on a scale of 1 to 10.